Jean’s question is so common. Having the latest iOS version on your iOS device is appealing. However, if you have to lose all your crucial data to update the device, you would prefer keeping your old iOS operating system. What if there was a way to have both: the new operating system and all your data? If you are using an older iOS version and you would like to use the latest version, this article will show you how to update to iOS 12 without losing data. iMyFone TunesMate is a tool developed to make it possible for you to transfer the media data you have on your iOS device to your computer/iTunes and vice-versa. If you are to update your iOS device to iOS 12 and you are afraid you may lose your media data, you can transfer this data to your PC and then import it to your device after updating to iOS 12. Unlike iTunes which only allows a one-way transfer, TunesMate allows you a two-way transfer. You can easily import and export your data. iTunes limits you to only using 10 devices. In these 10 devices, no more than 5 computers can be used. TunesMate has an unlimited number of devices and PCs. 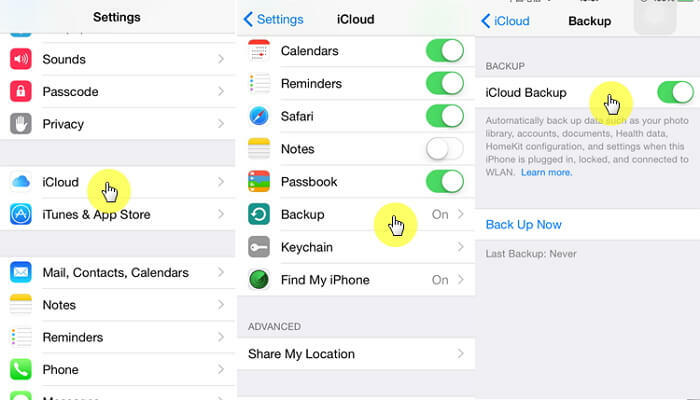 When you are using either iCloud or iTunes, you are forced to either back up all your data or nothing. When using Tunesmate, you get to preview your data and then select what you wish to back up. The backup process does not involve a lot of steps when you are using TunesMate. A single click is enough to transfer all your data. For a large number of people, bypassing iTunes which has numerous errors, limitations, and bugs is important. This is exactly what TunesMate allows you to do. Launch TunesMate and connect your device to the computer using a USB cable. Tap “Transfer iDevice Media to iTunes” on the Home interface. Tap Start on the pop-up that appears. 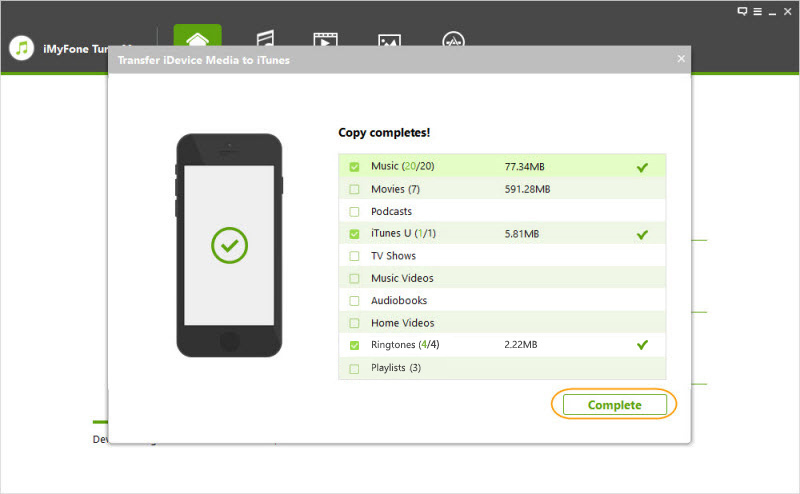 TunesMate will scan all the media files you have on your device. These will be displayed in a list. All the media files will be checked. You can uncheck the media files you do not wish to transfer to iTunes and then tap Start. Tap complete when the transfer is finished. Using your USB cable, connect your iOS device to your computer and launch iTunes. Tap your iOS device icon on iTunes and click Summary on the sidebar. Under Manually Back Up and Restore, tap Back Up Now. Tap Done when the backup is finished. iTunes has a lot of limitations. These include limiting the user to a one-way transfer. It supports a total of only 10 devices. It is possible to erase your data during the syncing process. Also, you can’t transfer freely between PC and iOS. These are the limitations TunesMate helps you avoid. Launch settings, tap your Apple ID and then click iCloud. 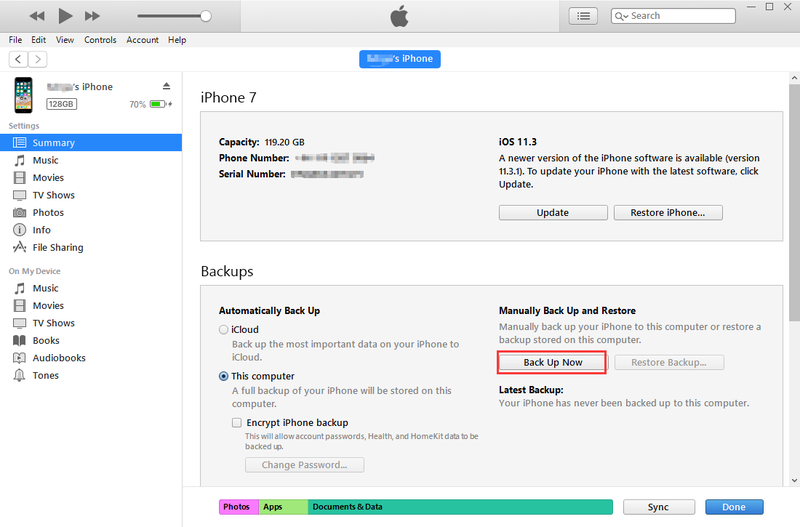 Click iCloud Backup and then tap Back Up Now. iCloud does have limitations. You can either back up all your data or nothing. It does not allow you to back up your device selectively. Also, without a strong internet connection, backing up your device via iCloud will not be possible. iCloud backup storage is limited. If you have already exhausted the 5GB space offered by Apple for free, you will have to pay each month in order to continue backing up your device on iCloud. If you would like to Update to iOS 12 without losing data, you have to back up the data first. This can be easily achieved when using TunesMate. With TunesMate, you can selectively back up your media files on iTunes. 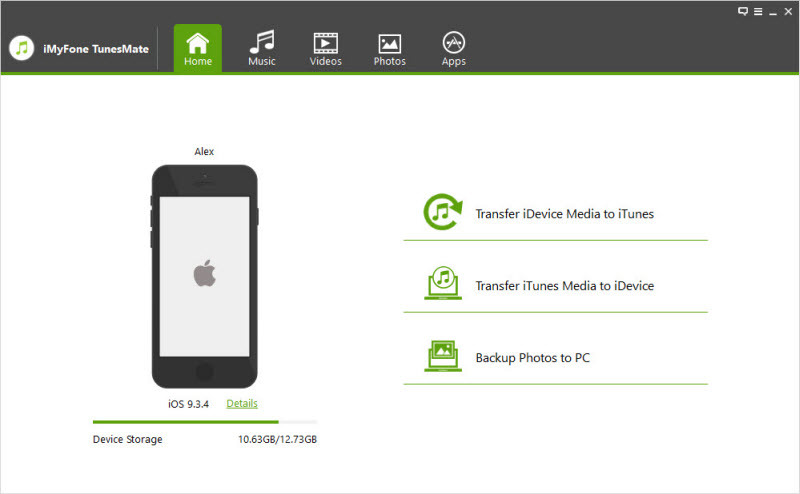 After updating your iOS, you can simply transfer your media files from iTunes back to your iPhone with a single click. While iCloud and iTunes are the options offered by Apple for backing up iOS devices, they usually have too many limitations. To mention a few here, iCloud needs a strong internet connection and it has a very limited free backup storage while iTunes has the possibility of losing your data during the syncing process.